Family & friends are invited to attend Visiting Hours on Tuesday, February 5th from 4:00 p.m. to 8:00 p.m., in the Vertuccio & Smith, Home for Funerals, 773 Broadway (Rte. 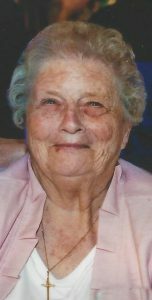 107) Revere, for Ethel M. (Gatchell) Long, who passed unexpectedly on Saturday, February 2nd at Boston’s Massachusetts General Hospital. She had lived for the past three years at Revere’s Lighthouse Nursing Care Center. Her funeral will be conducted from the funeral home on Wednesday, February 6th at 10:00 a.m., followed by a Funeral Mass to be celebrated at 11:00 a.m. in St. Luke’s Episcopal Church, 201 Washington Ave., Chelsea and immediately followed by interment in Woodlawn Cemetery, Everett. Ethel was born & raised in Revere and was an alumna of Revere High School, Class of 1953. She spent all her life caring for her family and extended family. Ethel was a life-long member of St. Luke’s Episcopal Church & was a most active member of the many societies & ladies’ organizations within the church. She was also a long-time member of the Margaret Winthrop Rebekah Lodge #152. She was the beloved daughter of the late Rolfe K. & Ethel A. (Boehner) Gatchell. She was the wife of the late Robert E. Long, Sr., who died unexpectedly in March of 1985. She is the cherished mother to Sandra L. Davis & her late husband, Anthony of Revere & Sandra is the companion of Jack Donahue of Revere, Michael E. Long of Billerica, Patricia A. “Tricia” Winn of Billerica & also the mother of the late Robert E. Long Jr., who passed unexpectedly on January 9, 2018. She is the devoted grandmother to Matthew J. & Hailey E. Winn, both of Billerica & Jessica L. Ralphs of Revere. She is also the dear sister of Robert W. Gatchell & his wife, Geri of Saugus & the late, Rolfe K. Gatchell, Jr. She is also lovingly survived by 2 sisters-in-law, Emelia R. Gatchell & Sunook Gatchell, both of Revere & many nieces, nephews, grandnieces & nephews. Ethel loved her time with her family & extended family. Every picture of her at family events is dominated by her beautiful smile of contentment & love. Tuesday, February 5th from 4:00 p.m. to 8:00 p.m.